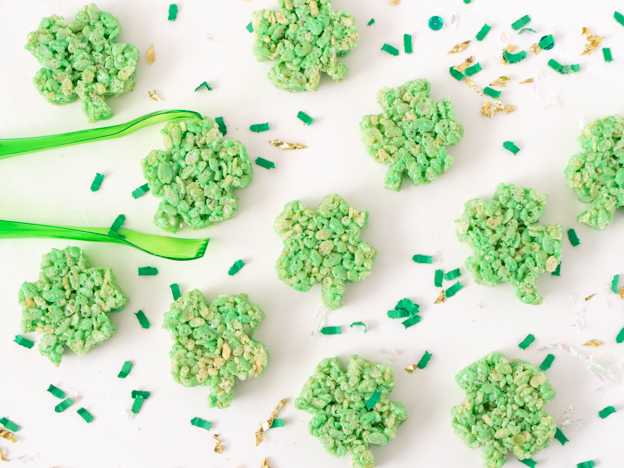 With St. Patrick’s Day around the corner, it’s time to start thinking about a day full of GREEN. Green clothing, green food, green cocktails and so on! 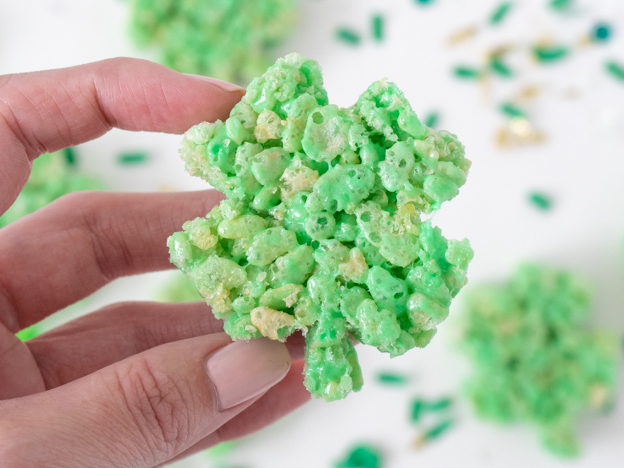 And these easy four leaf clover Rice Krispie treats are the perfect St. Patrick’s Day snack you know your kids will love. They are super easy to make and since they take no time to make, they are also perfect for procrastinators. You know who you are. 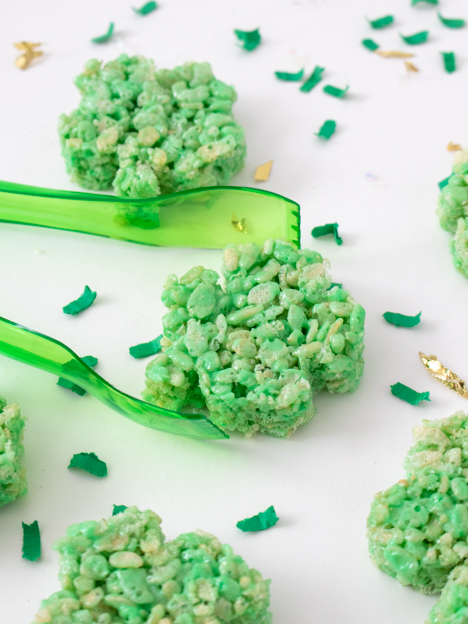 Rice Krispie treats are still one of my favorite snacks as an adult, so I’ll look for any way to make them themed if it means I get to make and eat more of them! 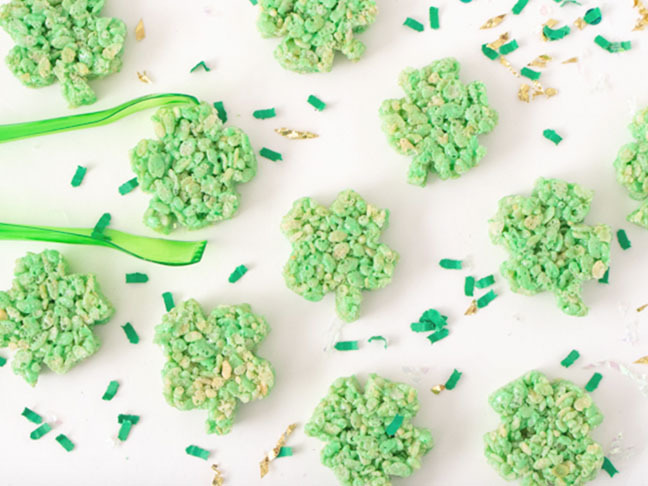 A little green food coloring and a shamrock or clover-shaped cookie cutter are all you need to make these cute St. Patrick’s Day Rice Krispie treats. One pan will make you about 12 treats (and only about 10 minutes of work) depending on the size of your cookie cutter. Step 1: Spray a small pan about 9x11 inches with cooking spray and set aside. Step 2: Pour the cereal in a large bowl. Step 3: In a small saucepan on the stove, melt the butter over low-medium heat. Once melted, stir in marshmallows. 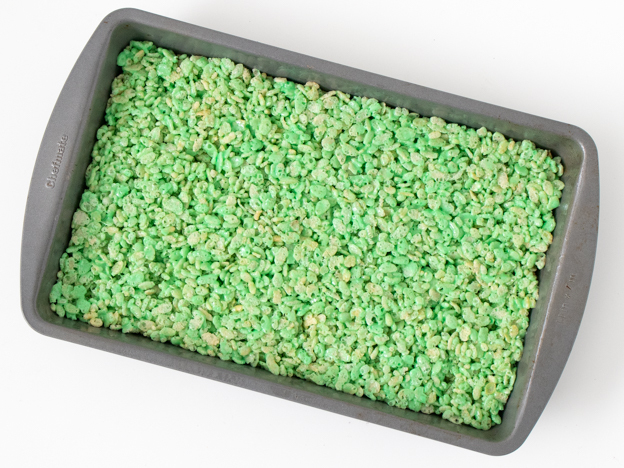 Step 6: Pour the marshmallow mixture over the rice cereal and mix with a spatula (spray with cooking spray to prevent sticking) until entirely coated with green marshmallow topping. Move to prepared pan. Step 7: Allow to cool for a minute before using a greased spatula to press the Rice Krispie mixture into shape in the pan. Let cool completely before cutting. Step 8: Remove the entire piece of cereal onto a piece of parchment paper and use a cookie cutter to press the shapes out of the treats. Reshape as needed. Store leftovers in an airtight container at room temperature for up to a week.